Aldrovanda has proven NOT to be an invasive nuisance plant, which is just one of the many misconceptions about them. They are in fact extremely difficult to naturalize; less than 1% of the attempts to naturalize have survived, even then, most eventually die out. Fact is that they are rapidly going extinct in their natural habitats and sites, even in Japan. The sites in which I have them naturalized are all on private property, and isolated away from pristine and protected areas. This is the ONLY way they grow. They have a very complex and intimate symbiotic relationship with several other creatures and plants, and cannot exist without these complex relationships in place. They are also very effective predators of mosquito larvae, even in their largest forms, some species are vectors of some very serious diseases and can be used as a biological conrtol mechanism. They are rootless plants and need to feed; if they don't have enough food, they go into decline. If they feast on a population explosion, they can respond effectively with an exponential population growth, otherwise, they will go into decline, and die off. If you are going to be judgmental and condescending enough to use such words as "irresponsible", I suggest that you have the facts to back up those accusations; obviously, you clearly do not understand the facts about these plants. Plants such as D. capensis, U. inflata, (and several species of Utricularia) do in fact pose a threat to native plants, but Aldrovanda is NOT one of these plants. May I ask, who proved that Aldrovanda is not invasive? I am curious. I mean not to be rude in any way, but since you demand facts to back up any accusations, you should list up some yourself so that everyone is convinced. For a start, please define your nuance of the phrase 'invasive nuisance plant'. Also, where did the number '1%' come from? It will seem to be an exaggeration until you come up with some backing literature. Firstly, Aldrovanda should never be the only thing being saved. As you said, Aldrovanda seem to benefit from the presence of other creatures. It would then be pointless to save only the Aldrovanda, and to move them to a different place. We should focus more on saving the original habitats themselves. Your statement that Aldrovanda can grow exponentially contradicts your earlier statement that it is very hard to naturalize Aldrovanda. Many places in the world have abundant insect populations, so it should not be difficult to trigger extreme growth of Aldrovanda. At least, 'less than 1%' success rate seems to be an exaggeration. The idea of using 'natural biological control mechanisms' has met with many examples of failure in the past. In many cases, the introduced predator did little good to exterminate the vermin, killing off some other creature instead. Additionally, the vermin can also serve some important factor in the food chain as well. In Okinawa (Japan), officials introduced mongooses to combat native poisonous snakes, which caused damage to people and livestock. 30 mongooses were brought in to the island of Amami. However they never really picked a fight with the dangerous snakes, instead preying upon other animals, many of which are now endangered. From 2000 to 2004, over 15400 mongooses were captured in a governmental attempt to reduce mongoose populations (so there were over 15400 mongooses alive over the 4 year period). Top scientists at the time were not able to see the flaw in their logic. So far you never wrote a single piece of credible fact. I again repeat that I am not trying to fire up an argument, but it is weird when you demand factual back up when you have none. Not only have I proved that these plants are NOT invasive, but many others have had similar results in Europe and in Japan, in efforts to reintroduce these plants into sites which they once grew, often fail to thrive, and quickly go into decline. Even in this site where I have them, there are deeper areas where some strands drift, driven by winds, and a small current, but then, once they get into these deeper areas, they quickly go into decline and die off within a week or so. They have a very narrow set of conditions which suite them, which includes several symbiotic relationships with other creatures and companion plants, including their prey; they really need to feed. If these conditions are not ALL present, the Aldrovanda will die back. After some 12+ years of observing them, and exchanging notes with others, both in this country and in Europe, some observations are fairly consistent. I don't suggest, (nor imply) that they should be used as a biological control mechanism for mosquito population, just reporting my observations that during a population explosion of zooplankton including mosquito larvae, Aldrovanda feed heavily, and respond to that by growing exponentially. When the population crashes, the Aldrovanda population also crashes and they go into decline and die off. This also has been observed by several people. There are many good examples of nuisance exotic invasive plants, Florida has many of them, some are displacing native species of plants; Aldrovanda, so far, has shown that it does NOT displace any native species, including Utricularia; they occupy totally different niches. Quite frankly, I don't feel any need to prove anything to you or anyone else, just share my observations with others who also have similar experiences with them. This self-righteousness reeks with arrogance and ignorance, and does little to further the advancement of the science of these plants. I do respect your 12 years of experience with Aldrovanda, but as I recall several other members have protested against your methods, and I do believe you should make it more clear from the start that you have the plants under your control. While it is agreeable that Aldrovanda will never go into mass invasion, it may still override local ponds here and there, provided that the necessary requirements are met; it may then drive out some very local species out and that will not be good. I do apologize if I sounded arrogant, but I did it so that my point got across without any misinterpretation. I needed to make my words deliberately clear. Having said that, I still am not satisfied. You asked for concrete arguments with credible back up, but now that I gave you one, you call me arrogant and ignorant, and further say that you feel no need to argue back, when you started this controversy. I am certainly not arrogant nor ignorant. All it takes to end this argument is for you to show that you do understand there is a small chance that Aldrovanda may cause harm. I do not understand why someone should be angered by such a notion. You and your friend's experiences only describe a small piece of fact: there is no knowing how Aldrovanda will fare under different conditions. Your previous posts suggests that you are confident that Aldrovanda cannot be invasive, which, by scientific means, should not be possible, because we have not tested how Aldrovanda will react to every single possibility. Therefore, you should never be absolutely confident that Aldrovanda cannot become invasive. You also typed that Aldrovanda "can be used as a biological conrtol mechanism", how can that not imply that you think Aldrovanda can be used as biological control? If you used this phrase in some other nuance, then please explain. I am not trying to interrogate you, but that phrase was misleading. So you’re not satisfied, well I can live with that, it’s not my problem. When you have been able to grow these plants well for a few years, then you will be in a position to argue these points with some degree of credibility. I seem to have become the “lightning rod” for this, and that’s fine, I can deal with it; curious that I don’t hear such criticism from those people who are authorities on these plants, only from those people who have never grown them, know next to nothing about them. The comment I made on Aldrovanda being a biological control mechanism was meant in a technical theoretical ecological context, as in the Lotka-Voltera models that describe various predator-prey relationships in mathematical models. The prey, referred to as n-strategists, are defined as those creatures (in this case zooplankton, including mosquito larvae) who, in the presence of an unlimited food source (aquatic algae in this case) will demonstrate a propensity for unbounded exponential growth, which eventually reaches a “critical mass” where the population crashes, and the pond goes into cyclic patterns of oligification and eutrophic states. An effective predator, referred to as k-strategists, are often more stable in their population growth, can prevent these catastrophic cycles and keep the prey population under control; Aldrovanda seems to occupy such a niche, as these cycles do not seem to occur after a stable predator-prey balance has been achieved. I’ve been involved with Aldrovanda far longer than 12 years, it’s only the last 12 years that they have been naturalized in a few small, isolated private ponds which have enabled me to study them in a natural (albeit, not native) habitat, which allow me the oppertunity to observe how they interact with other plants and situations during their life cycle. This has resulted in several astonishing observations and revelations that obliterate many of the misconceptions about these plants. There is nothing wrong with this. Many of the crops that are farmed in this country are not indigenous plants, nor are the various garden plants we all grow indoors and out; some do escape and present some problems with the native plants, which is unfortunate. I do understand the concerns for exotic invasive plants that wreak havoc on the environment, such as kudzu, Chinese porcelain-berry etc., both are very capable of overwhelming trees and killing them en-mass, but so far, with a lot of others growing these plants, or attempt to restore them in their natural and native habitats, Aldrovanda has yet to show any signs of getting out of control, and posing any threats to indigenous plants. 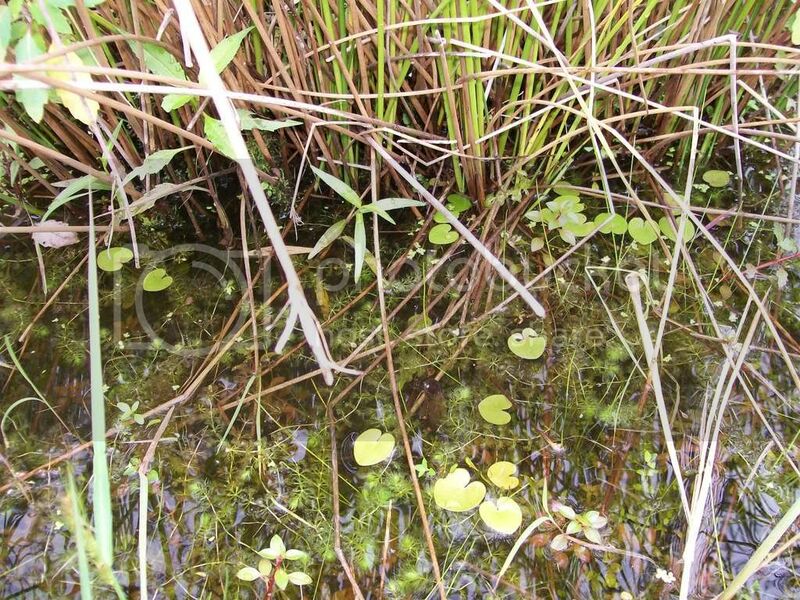 In this photo (taken by Dave Evans), you can see the presence of duckweed and a small water lily that reproduces rapidly by seed, and asexually both by tubors forming off their roots, and by sending out stolons, (just like strawberries), both duckweed and this plant will seize every available square inch of surface area of this pond, and overwhelm the Aldrovanda underneath them if it were not for a lot of labor intensive work by me and others to remove these things almost on a weekly basis during the growing season, otherwise they would be smothered out within a few months. They also can go into decline very quickly for various reasons, and several creatures have been known to graze heavily on them, from turtles, to ducks, geese, and several fish, especially when they are in dormant turion form, full of starches and sugars. I’ve also introduced several native species of Utricularia in this small pond, and curiously, they have had a very difficult time until Aldrovanda also grew with them; they grow together, comingled sometimes, but occupy very different niches, and different parts of the pond; most of the Utrics seem to come out first, flower, set seed, and die back, then the Aldrovanda seems to get going; they also seem to sort out according to depth of the water, the Utrics preferring the deeper places, the Aldrovanda occupy the more shallow areas, and always around large monocot marginal plants. How do you know that I haven’t studied Aldrovanda in other possibilities? You assume that I haven’t or exchanged notes with others who have done similar studies. Fact is that I have, many times, attempting to force them to grow in small cages in deeper water, in places with a range of pH, and temperature swings, etc; it’s taken many years. I have also compared my notes to others who also have managed to naturalize these plants in their own backyards (most shy away from making themselves known due to these criticisms and self-righteousness that I have received), including well known and accomplished authors of scientific documents, and compared my notes and data with them. You should realize that this is just an internet forum where we can share some observations in an informal setting, and NOT a formal scientific platform where our statements should be referenced accordingly. So, I have been watching this interaction with great interest, and the last post by rsvertsen has baited me into comment (I've caved I admit it, I'm weak). Rsvertsen - Like many experienced growers here, you seem to comment in ways that suggest to the uninitiated they should be concerned with conservation, and then when confronted with questions about your own actions, get very sensitive and respond as if attacked. I would think the experienced growers here would be proud of the conservation ethic (if not the tact) exhibited by those less experienced (and certainly some have been and to them I say thank you). I would also remind everyone, no matter how experienced in the hobby, that their actions will never be above questioning. And while we are discussing the term "hobby", I would remind you, that you are a hobbyist. Nothing you have described thus far is scientifically rigorous (despite your call for "facts" to back up claims earlier in the thread). I am not trying to make you, solely a "lightening rod" for this type of controversy. Indeed, there was a similar incident here with someone asking a very experienced and responsible grower a few questions about Cephalotus, to which the experienced grow took great offense. I think this can be a general problem with hobbyists and professional horticulturalists. Yes, they have experience, but they still need to explain why their actions are acceptable to the uninitiated with the patience and knowledge their experience is supposed to have granted them. It is true, I don't know if you have done proper studies on Aldrovanda. However, if you are a scientist, you should be far more careful about your poor use of terminology and concepts (r and k selection is a separate construct from Lotka-Voltera predator prey models). Additionally, as a scientist one needs to be able to recognize the limits and risks inherent with an experiment or action. You have not displayed a willingness to do so. Nor have you shown an openness to contrary ideas (a foundation of the modern scientific method). All that said, I do not believe Aldrovanda poses a serious risk of becoming seriously invasive. Equally however, Bouncingwatermelon has several reasonable concerns. You and others have "naturalized" this plant - proof it can survive outside of it's natural range (though perhaps only aided?). Moreover, it has a large range covering much of the old world, suggesting both the potential for wide climactic adaptation and the ability to disperse over long distances. Its dispersal mode is hypothesized to be via waterfowl (Breckpot 1997), and you have noted twice in this discussion the interaction between Aldrovanda and water fowl. These combined could easily mean that Aldrovanda has the potential to spread beyond the your area of survey without your notice. Horticultural introductions, as you've noted above, constitute a significant source for exotic plant species (Reichard & White 2001). So, the overall concerns expressed here are founded. Additionally, simply because a species is rare or declining in its native range does not mean it cannot be highly invasive and problematic elsewhere: Zizania latifolia is emblematic among many examples. To those who are worried, I would like now back up my statement that I do not believe Aldrovanda poses a large risk. Unfortunately, the one of best predictors of the likelihood of a plant species becoming seriously invasive is whether it has become invasive elsewhere (Kolar & Lodge 2001). What this means is we still don't know what allows plants to become successful invaders in new communities, but in the case of species like Aldrovanda, where people have already gone ahead and introduced to it many places, we can, with a reasonable degree of certainty, say it is not likely to become a problem. With this I am not trying to defend the actions of people who casually introduce species to new habitats, my only goal here is to explain why in this case Aldrovanda may not pose a serious invasion risk. Does "naturalizing" it mean it will not escape? No. But in this case the risk may be minimal as we have not seen it spread widely. @ Apoplast, now that you have joined this discussion, perhaps you could get the spelling of my name correct; it is rsivertsen (as in Richard Sivertsen) NOT "Rsvertsen" as you have posted. I only wonder what other things you don’t get quite correct before you launch into one of your replies. I don’t feel “attacked” or "sensitive" as you have mentioned, but do take exception to those who seem compelled to pontificate some self-righteous conversational edict with regard to this species while not having any experience or knowledge about this species, nor having any direct experience in a long term capacity, to pass such judgmental statements about growing these plants as I do in my isolated private ponds. With regard to the Lotka-Voltera references, this is either what I have in my library; (perhaps it was a misprint), or just my failing memory from what I had received back in the mid ‘70’s, but n and k models is what I recall is on my shelves. I never claimed to be a scientist, and don’t really care if anyone approves or disapproves of my methods; I have more than enough accomplishments in what I have done, and discovered to be slapped down by anyone; have a nice day, thank you very much for your opinions, good by! In the last 12 years or so, in which Aldrovanda has been reoccurring in this small pond, I have made numerous visits to sites that according to US Geological Survey maps, might suggest favorable conditions which could support Aldrovanda if they were to be introduced by migratory water fowl, but so far this has NOT been the case. There are dozens of places within the radius of 20 or so miles from these sites that have aquatic features that may be suitable for Aldrovanda, but so far, year after year, they turn up void of any signs of this plant; either they are too deep, too cold, too dark, too acid, or the water is moving too fast, or they have the wrong plant associations, etc. 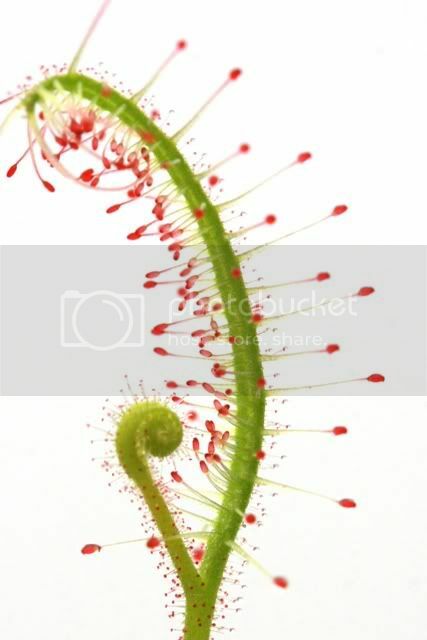 Again, I don’t make any claims to being a pretentious scientist or any authority on anything, just a serious person interesting in Carnivorous Plants, and Aldrovanda just so happens to be my latest interest. I do apologize for not proofreading my post closely enough to have caught the type-o of your screen name. I will be sure to check that more closely in the future. Despite you assurances to the contrary, you do seem from my perspective, to be quite upset. That was not my intention. I only wished to correct some of the inaccuracies in your posts, and to express my concern with your agitated response to what seemed, initially, to be a reasonable question from someone, who I am sure you are correct, is less experienced with Aldrovanda than yourself. You appear to take exception to peoples' queries and I feel that is unfortunate, because if your responses were more congenial, I am certain we could all learn a great deal from your experiences growing Aldrovanda in semi-natural settings. I must disagree with your final statement in you last post however. Throughout, you have very much presented yourself as an authority on Aldrovanda cultivation (among other aspects about this species). Additionally, your heated response suggests to me you would like people to recognize your expertise in cultivating this species. All I am suggesting is that explaining your responses calmly and and limiting your explanations to areas of your expertise would yield better results. Even though you don't feel "attacked", I am still sorry if you are upset with my comments. If you will read through my previous post, you may realize that I am not condemning you for having grown this species outside. That would be a rather extreme stance on my part. All I had hoped to suggest was that once outside, you no longer have total control, whether it is necessary to maintain it or not. And, that alone will lead to questions from concerned parties. Once again, I never claimed to be any authority on these plants, nor am I upset or agitated by anything that anyone has posted so far; I’ve heard it all many times already, usually by some arrogant and pretentious idealist who doesn’t have a clue what this plant is all about. I do respond to others who express serious and genuine concerns about these plants, and if you have researched these posts, you would have realized that fact. I only report my observations based upon the experiences that I have achieved over the years. If someone feels the need to criticize those efforts, then I hope they are prepared to compare their evaluations based upon their experiences on the subject; is that too much to ask, just keeping “apples to apples” and all? Our main point in the argument was whether Aldrovanda can become invasive or not: based on info on the internet and elsewhere, I believed that to be true, while you did not, as your experiments showed that Aldrovanda was very sensitive. Should I be able to reproduce a sort of environment where Aldrovanda can thrive under many fluctuating factors, including those occurring frequently in nature (and grow to a point where native plants are overridden) , I would have some credibility to my argument that Aldrovanda can override natural environments. I'll come back to this once I have enough experience. I applaud your efforts and I'm prepared to support your research as much as I can! If you prove me wrong, I will only be too happy to acknowledge that, and it will further the body of science on this subject; but so far, these efforts have proven otherwise. The problems seems to be in the numerous misconceptions regarding these plants. This needs to be remedied and reality checks need to be confirmed. Peace, brother, and let the science prevail!